Prequel to the first two instalments of the Underworld series, which tells the story of the first Lycan Lucian (Michael Sheen), a slave to Vampire eldest Viktor (Bill Nighy), and explains the new race of Lycans. 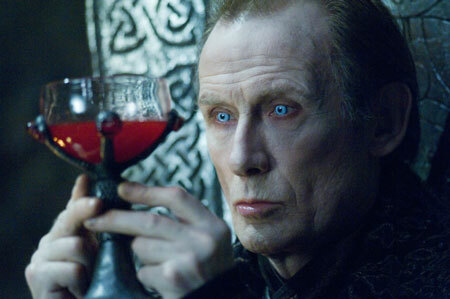 Vampire eldest Viktor (Bill Nighy) lets Lucian (Michael Sheen), son of Corvinus, who is origin of the Vampires too, live, but keeps him confined. Lucian has to wear a spike collar, which keeps him from turning into a werewolf. 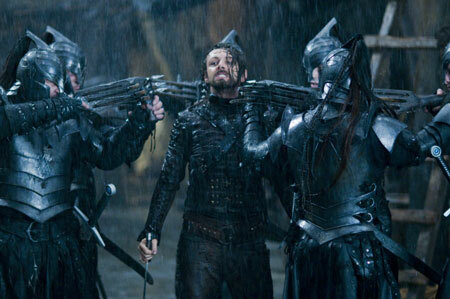 Lucien becomes a smith, but he is furthermore used by Viktor to breed the slave race of Lycans, i.e. more human werewolves. The vampire's fortress is threatened by werewolves again and again. 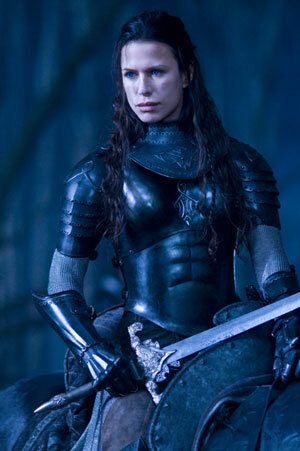 Viktor's disobedient daughter Sonja (Rhona Mitra), who is a counsil member, rides out against her father's will to patrol. When she returns home one time she gets hunted by three werewolves, Lucian kills her hunters and rescues her. She doesn't show any gratitude, but soon it turns out that Lucian and Sonja have a secret love affair. Lucian wants to flee with Sonja and has made a key for his collar. Sonja rides out again against Viktor's explicit order to oversee the carriage of a human noble family and they are attacked by a large group of werewolves. Lucian has to intervene, take off the collar illicitly and as a werewolf command the attacking werewolves in order to save his lover. But instead of receiving thanks from Viktor, he gets punished and imprisoned. With the help of Tannis (Steven Mackintosh), who knows about their relationship, Lucian is able to escape from the fortress with a group of Lycans. He gathers a band of followers. Viktor uncovers Sonja's plans and confines her. She told Lucian she would follow Lucian, but she doesn't show up. Lucian doesn't want to leave his beloved behind and returns to the fortress to rescue Sonja, even though the trap is more than obvious. Thereupon unfolds the rise of the Lycans. The Underworld series stands out against the rest of the Vampire genre because the bloodlines were not created by supernatural force, but by viruses. The series was created by Danny McBride, who wrote the screenplays to all three instalments, and Len Wiseman, who directed the first two movies. Director for the third film is Patrick Tatopoulos, who designed the creatures for the first two films and several others (e.g. "I, Robot", "Independence Day" or "Godzilla"). This is his first time he directs a full-length film, and he does it quite well. The action sequences are not satisfying, though, because the camera is to close to the action and the editing pace is too high. That makes it extremely difficult to follow movements. It's not very pleasant to watch. The third part of the series is a prequel telling how the fight of Vampires against Lycans, i.e. human werewolves, began. That is the reason why Selene (Kate Beckinsale), the main character of the first two films, doesn't play a role. Instead the focus lies on characters known from the first two instalments: Viktor, Lucian, the Lycan Raze, a minor character of the first film, who is enacted by Kevin Grevioux, the third creator of Underworld, but also on Viktor's daughter Sonja, who was introduced shortly in flashbacks in the first film. 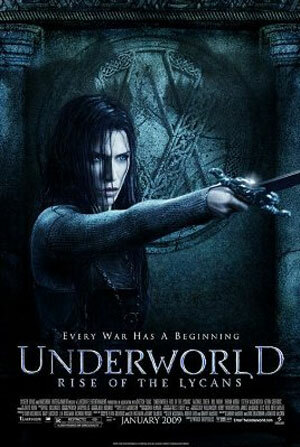 Indirectly Sonja is responsible for the war between Lycans and Vampires, and this is symbolized by a round pendant, which Lucian carries with him in the second part "Underworld: Evolution". It makes sense to tell the prequel to tell what happened before Selene, and the film is well made except for the action sequences. The story is pretty captivating, although without particular depth or emotional access. Those who liked the first two films especially because of Kate Beckinsale might be disappointed. But who likes the cosmos of the Underground and wants to dive deeper into the background story of the conflict, should definitely watch the new instalment. This background isn't very profound, though, but the film is still alright. That's the reason it is also suited for those who don't know the first two films and want to join in the series from scratch.